With VictorOps integration you can send your AppOptics alerts into your VictorOps timeline allowing you to use all of their Notification Management features. select Settings >> Alert Behavior >> Integrations >> AppOptics. If the integration has not yet been enabled, click the Enable Integration button to generate your Service API Key. Copy the Service API Key to your clipboard and determine which VictorOps routing-key value will be used for this integration. For more information on VictorOps routing keys and best practices, click here. 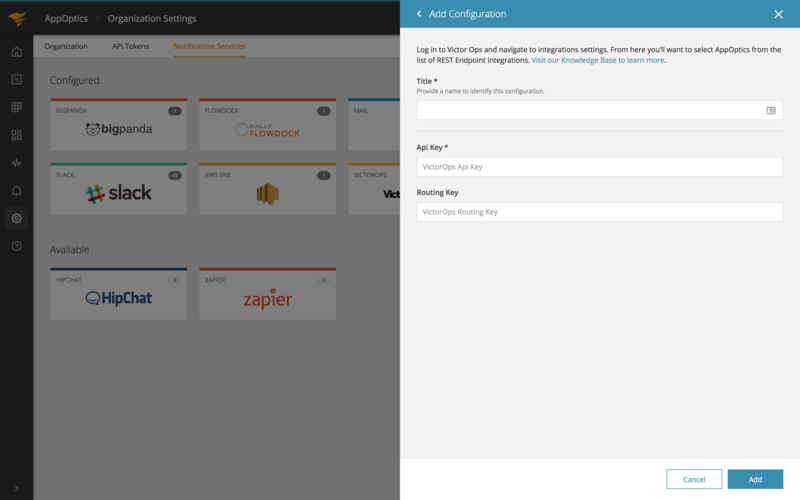 From the Organization Details section, choose the Notification Services tab, select VictorOps, and click Add Configuration. Give the integration configuration a title, then paste in the service API key and routing key you copied from VictorOps, and click Save. When an alert fires the payload is sent to VictorOps.